Instant translation and multilingual content management will be added to Coginov’s existing integrated Microsoft SharePoint products, Mail2Share™ and Attribute™. 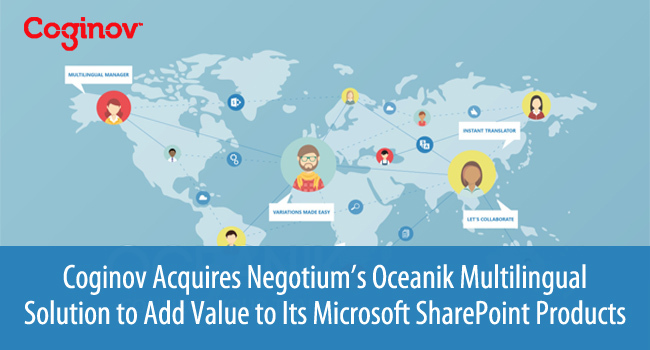 MONTREAL, QC, September 04, 2018 /24-7PressRelease/ — Coginov, a worldwide provider of semantic technology solutions, expands its Microsoft SharePoint product portfolio with the acquisition of Negotium’s Oceanik—a leading multilingual solution for SharePoint. The instant translator and multilingual management tool brings added value to Coginov’s clients, many of whom operate with collaborative, global workforces. “Oceanik is a global translation tool that simplifies the complexity of multilingual collaboration. Having the ability to use collaboration platforms like SharePoint in multiple languages is a must in today’s workplace, and Oceanik brings that to our offering,” says Jeannot Chapdelaine, CEO of Coginov. Coginov’s products for SharePoint include Mail2Share™, an Outlook plug-in that allows organizations to integrate email management with their document management strategy, and Attribute™, an add-on that uses an artificial intelligence (AI) engine to automatically extract relevant concepts and unstructured data from files and assets to make searching easier and more fruitful. By adding Oceanik to its portfolio, Coginov can now enable users to switch languages on the fly in SharePoint to any one of the 50 languages available and perform searches on multilingual documents in their selected language. “We’re excited not only to offer our clients the benefits of semantic technology in information asset management but also to support their collaboration across borders and in multiple languages,” says Marc-André Roy, VP of Sales & Marketing of Coginov. The transition of Negotium’s Oceanik clients to Coginov is underway, with the client support team ensuring a smooth process. For more information, contact the office nearest you. Founded in 2002, Coginov is a worldwide provider of semantic technology solutions designed to capture, analyze, engage, automate and manage information assets. With offices in Canada, the United States and France, its clients include worldwide leaders such as Bombardier, Lockheed Martin, BNP Paribas, Cirque du Soleil, Richemont, CFDT, Total, ICAO, Deloitte and Desjardins. Coginov delivers specialized software solutions through its expertise in semantic recognition, enterprise content management, search optimization and predictive business intelligence. Visit www.coginov.com for more information.